A probe of Treasury Secretary Steven Mnuchin's use of government planes found no evidence of wrongdoing but faulted the Trump administration for cutting corners in approving the trips. "I see no violation of law in these requests and uses," Treasury Department Inspector General Eric Thorson wrote in a report Thursday. The review, however, raised sharp questions over the White House process in justifying the use of government planes instead of commercial flights. "What is of concern is a disconnect between the standard of proof called for by [procedures] and the actual amount of proof provided by Treasury and accepted by the White House in justifying these trip requests," the report stated. The report called on the Trump administration to "justify" government air travel "in great detail" going forward. In fact, it cited a White House memo from last week calling for more rigor. "Every penny we spend comes from the taxpayer," the White House memo states. "We thus owe it to the taxpayer to work as hard managing that money wisely as the taxpayer must do to earn it in the first place. Put another way, just because something is legal doesn't make it right." The report reviewed nine trips to Italy, London, Miami, Las Vegas, Louisville and elsewhere -- seven were taken, one was withdrawn, and one is planned for later this month. The cost for the seven completed trips totals $811,796, according to the report. Mnuchin is the first Treasury secretary to face investigation by an inspector general for using military aircraft for travel -- personal or otherwise. "We appreciate the inspector general's thorough review of Treasury's travel requests, which identified no violation of law, regulation, or ethics requirements in connection with the department's requests," a Treasury spokesperson said in a statement. The department intends to incorporate the inspector general's recommendations. Inspectors general, which date back to the late 1970s and operate throughout the federal government, don't have power to mete out discipline. But their reports can apply public pressure on government officials to correct missteps. Senator Ron Wyden, the top Democrat on the Senate Finance Committee, called on the White House on Thursday to release requests for use of military aircraft by every member of the president's cabinet. "It's clear now that this scandal didn't start or end with former Health and Human Services Secretary Tom Price," Wyden said in a statement following the inspector general's report. Price resigned on Friday over his use of private charter planes for government business. In August, the inspector general began reviewing every trip Mnuchin has taken using taxpayer-funded planes during his 10-month tenure. The review found that Treasury often didn't provide enough detail about why Mnuchin needed to use government aircraft. For example, his trip to Ottawa to meet with the Canadian finance minister said he needed a government plane with secure communications because of "the potential for developments during travel related to a number of issues." His trip to Baden-Baden, Germany, for a G-20 summit was backed by emails saying why he couldn't take a commercial flight. But the department failed to add that information to its request to the White House, according to the IG's review. The review was sparked by a trip Mnuchin made to Kentucky with his wife, Louise Linton, on August 21, the day of the solar eclipse. 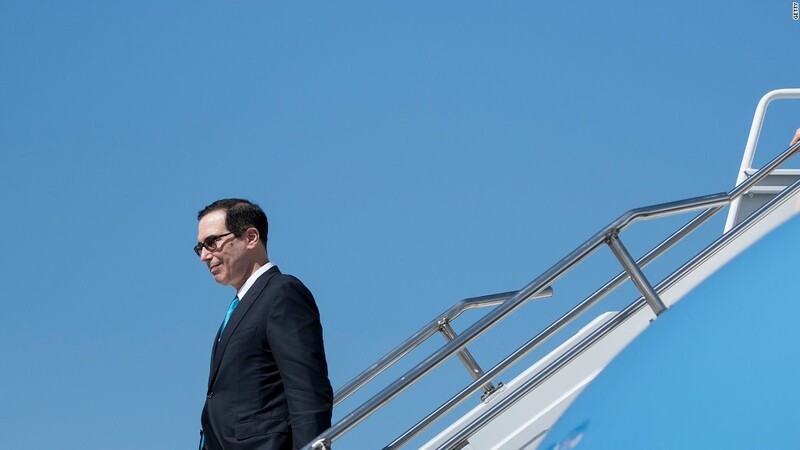 Mnuchin said he traveled to Kentucky to meet with Senate Majority Leader Mitch McConnell. According to the report, six dates were proposed to McConnell and "August 21 worked for everyone." The IG's report found "no indication that the date was chosen to coincide with the solar eclipse." The total cost of the trip was $26,900.25. Mnuchin paid the government back $595.90 for the cost of Linton's seat, according to the IG.